Earlier this month, two LEO Dublin City Women in Business Network members received awards. 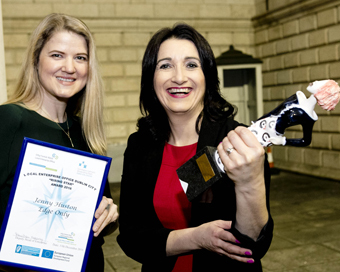 The winner of the LEO Dublin City Women in Business Network 2016 ‘Rising Star’ Award was presented to Jenny Huston of Edge Only (pictured on left). The winner of the LEO Dublin City Women in Business Network 2016 ‘Most Improved Business’ Award went to Marsha Abrahams of Boost Beauty. Their awards were presented in the House of Lords Venue, Bank of Ireland, College Green at the annual LEO Dublin City Networks event which also included Plato Dublin, The Business Network and the Dublin Food Chain. The LEO Dublin City Women in Business Network is an initiative of the Local Enterprise Office Dublin City to support females to start and grow new businesses. There are over one hundred businesses in the network and the main activity is a monthly networking event featuring a Guest Speaker on a topic of interest to members and informal networking. For more details visit their website.